Creekwalk Resort, a lovely Pigeon Forge cottage rental resort with swimming pool access just off the Parkway traffic light #6. Located in the center of Pigeon Forge, Creekwalk Resort is the perfect accommodations for visitors looking to attend Pigeon Forge Events or just having a preference to stay close to Pigeon Forge Attractions. 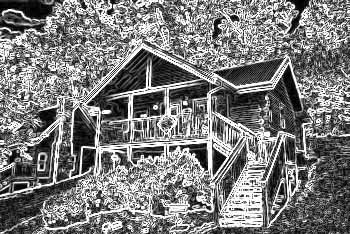 Cabins USA's Smoky Mountain cottage rental accommodations at Creekwalk Resort provide guest with that extra needed space and privacy most Pigeon Forge hotels are unable too provide and at less cost than some area hotels. During the warmer months be sure to enjoy the cottage resort swimming pool, perfect for cooling off after a full day of fun in the sun. Pigeon Forge Antique Car Show attendees have long favored our Smoky Mountain cottage rentals. SAVE! Book your Smoky Mountains cottage in Creekwalk Resort ONLINE and receive immediate savings with Cabins USA Pigeon Forge Tennessee.